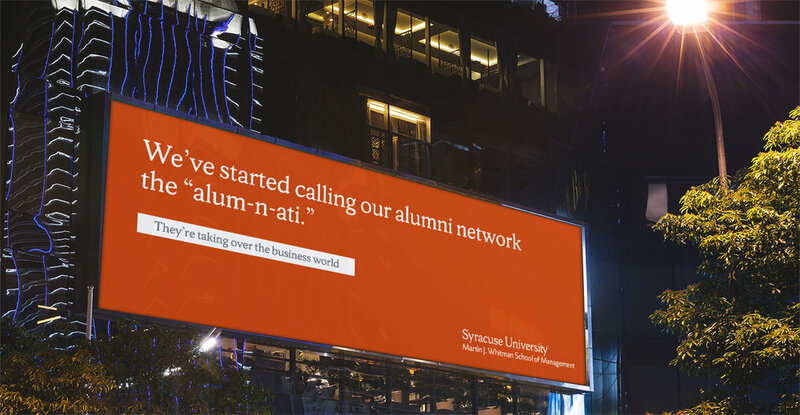 Furman Roth was tasked with quickly spreading awareness and generating qualified leads for the Syracuse Whitman School of Management’s full-time, on-campus MBA—a challenge impacted by a number of competing master of business administration programs, including Syracuse’s own online offering. The MBA market is a crowded one, and competition for students is steep, especially in light of waning full-time program demand. With a small budget and tight time frame, Furman Roth strategically divided audience spend and media mix around Syracuse alumni and current students, qualified veterans, recent graduates in target markets, GRE test takers within the last six months, and visitors retargeted from specific Syracuse web pages. As for the creative, we took a distinctive approach, creating stark orange ads with lots of linguistic sheen and ample negative space. Once we had saturated our audience pool, we then refreshed the campaign to maintain the same tone, and further the messaging by adding beautiful photography of real Whitman MBA students.